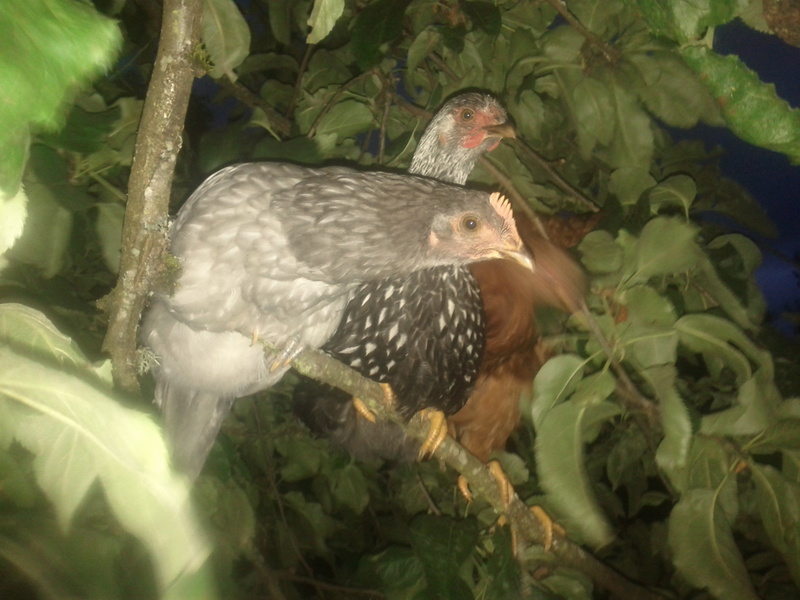 Hens roosting in the tree at night. We move them in their protected home to keep safe. Squash bloosoms – These are the male flowers after they’ve closed and done their pollination thing or the female flower after fruit has set. A delicacy that need to be used within 24-48 hours. Store in fridge. Prepare by sauteeing in oil until browned, or breading and frying. Yum yellow pop of summer! 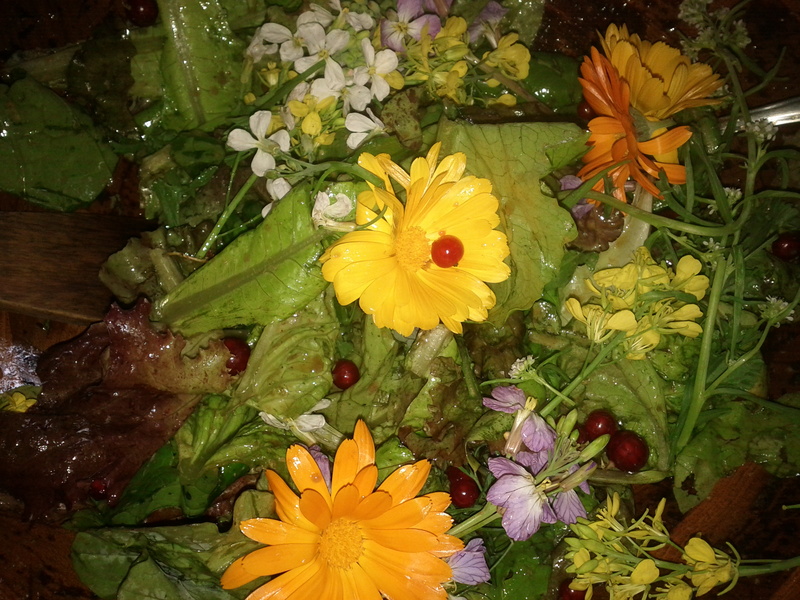 Salad Mix – 1/2 lb with edible flowers: borage and calendula pedals. Lots of cut lettuce so perishable, best used within 3 days. 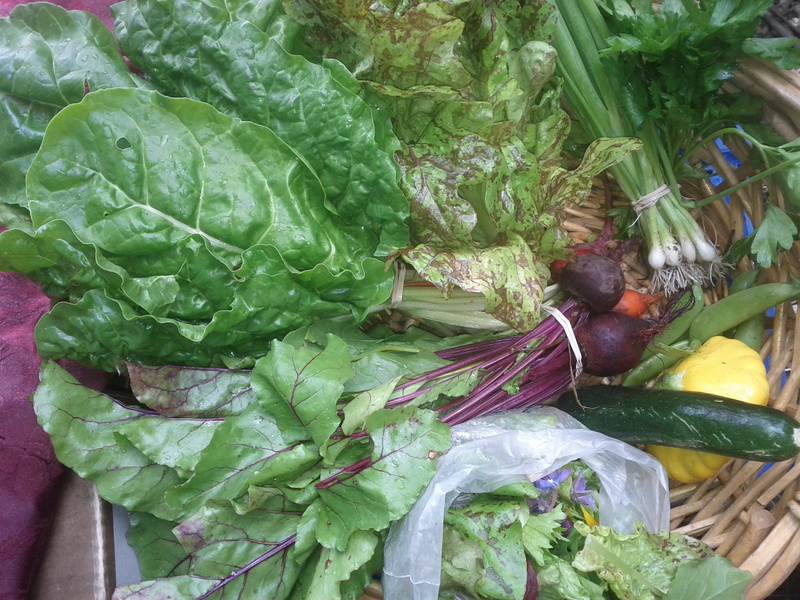 Chard OR Kale – All that rained bulked up the greens, they loved it! Parsley -High high in vitamin C and others make you feel good nutrients and minerals. Beets –greens tasty cooked up too. Okay, so one or more of the recipes weekly with be Melanie style cooking. Not a list of ingredients and step by step instructions but general portions and ideas because that’s how I cook! I hope its helpful! Cut beets in halves or quarters. Steam until you can easily put a fork through them. Slice faw fennel with mandolin or thin slices horizontally. Add a pinch of salt, olive oil and chopped parsley. Great ideas of what to do with chard stems. Deborah Madison’s recipes and ways with food are awesome! This recipe, adapted from Laurie Colwin’s More Home Cooking, is one of my daughter’s favorites. Both the color and taste are intriguing, and I like that it makes a meal-in-a-bowl in about 30 minutes. Peel and dice the beets. Dry and chop the beet greens; set aside. Cook the pasta in boiling water until al dente and drain. While the pasta is cooking, coat the bottom of a cast-iron skillet or sauté pan with olive oil. Over medium heat, cook the diced beets, shallot, and red pepper flakes, stirring often, until the beets are almost tender. Add the garlic, stir, and cook for 1 minute, then add the broth and lemon juice. Bring to a simmer and cook until the beets are tender and the broth is reduced to a syrup-like consistency. If necessary, add more broth or water. Add the reserved, chopped beet greens, lemon zest, and chopped herbs. Stir and cover. Once the beet greens have wilted, season to taste with salt, then toss the beet mixture with the drained pasta. Serve with grated Parmesan cheese. This content is from the Culinate Kitchen collection. Summer! 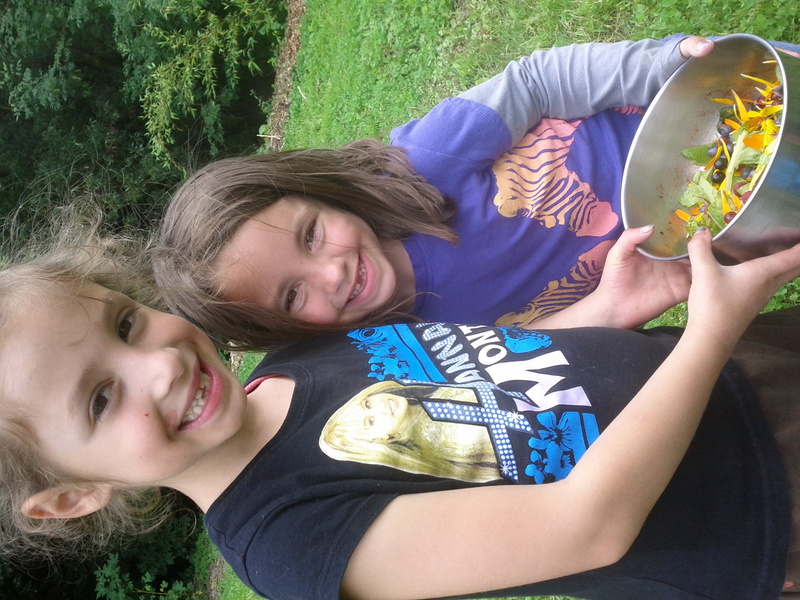 Clouds and rain but warmish nights and summer squash! So many creatures are out at the farm busy, many many insects in the fields and a snakes near the field too. It is diverse and abundant out here. The rain brought a green freshness which was quite refreshing. 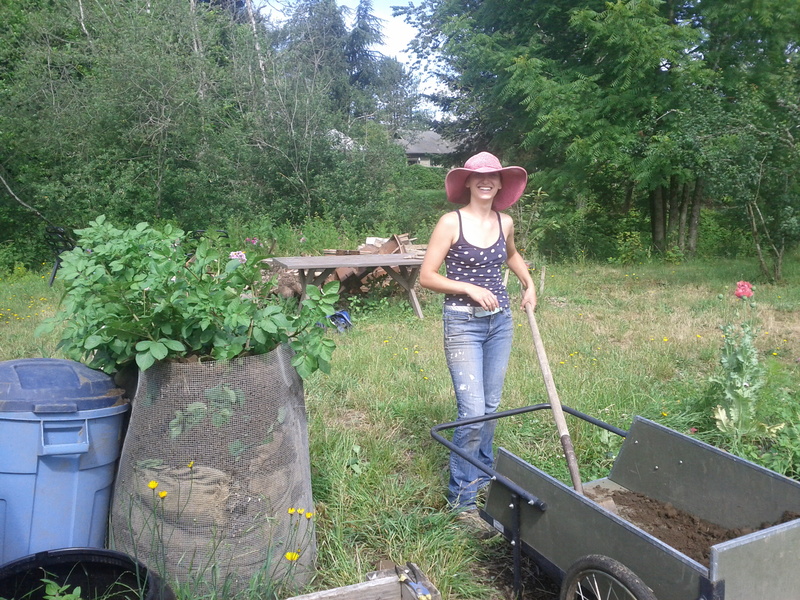 As we shift into summer, the peas are puttering out as the beans come in. 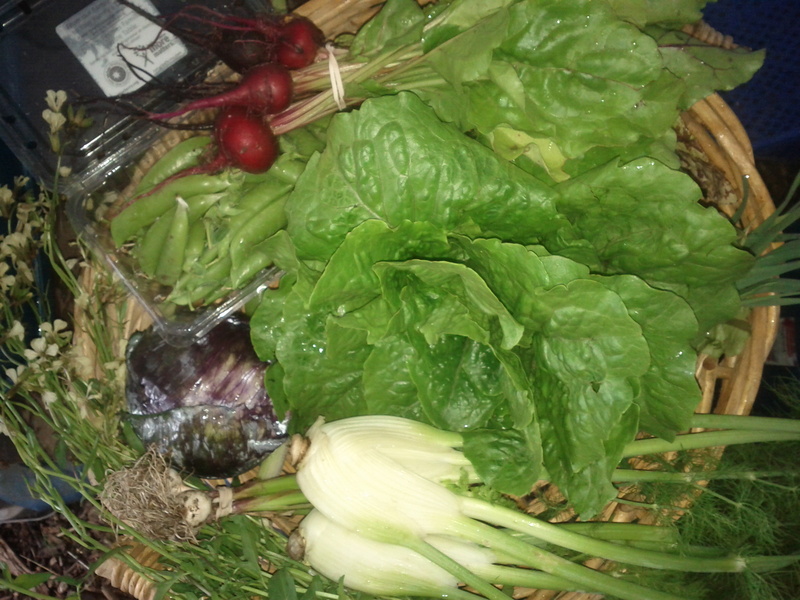 It’s a smaller box this week as the spring crops are on the out and all of the summer crops haven’t kicked in. 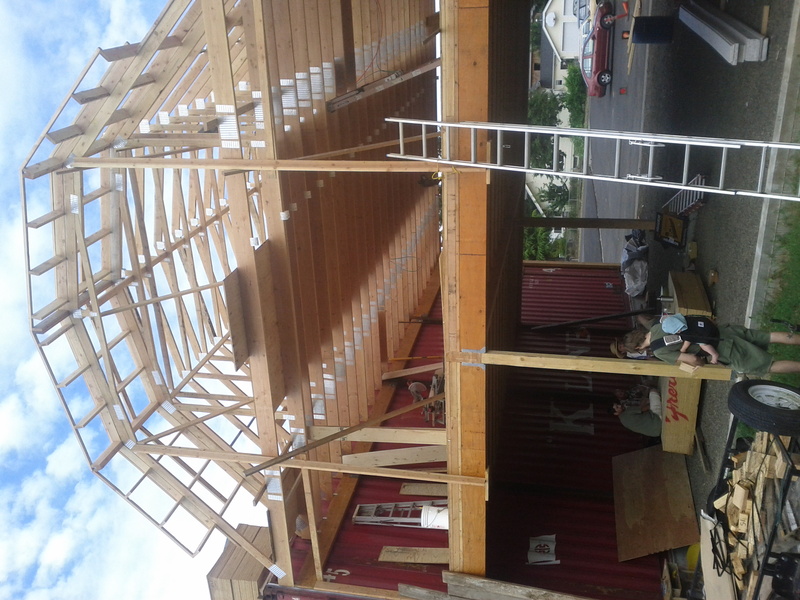 It’s been a big week on the farm with other projects like the woodshop/community space–roof up! (see pic below). Carrots – thumbelina variety. cute early thumb shaped deliciousness. Tops can be used in soups or a small amount for taste and texture in salads. Summer squash – Is the name that includes zucchini and all other varieties. Spring Onion – Red torpedo variety, not a storage onion. Green tops can be used like scallions. Store in fridge. My land-mate Cori just made this from and it is healthy and delicious! This bread freezes well and can be served plain or with your favorite jam, jelly, or just plain butter. Preheat oven to 350º. Grease two 8 x 4-inch nonstick pans. (For smaller loaves, use three or four 5 x 3-inch nonstick loaf pans.In large bowl, cream oil, sugar, eggs, applesauce, and vanilla together with electric mixer until very smooth. Add flour, baking powder, cinnamon, xanthan gum, salt, and cloves. Mix thoroughly on medium speed until thoroughly combined. Quickly (but gently) stir in zucchini, nuts, and raisins. Batter will be somewhat thick. Turn batter into prepared pans. Bake 8 x 4-inch loaves for 60-65 minutes; 5 x 3-inch pans for 45 minutes. Place foil over bread during final 20 minutes of baking to reduce over-browning. Cool in pan for 10 minutes, then turn out onto wire rack. Cool thoroughly before slicing. Makes 12 slices. We made this today for the farm lunch, simple and yum. Sautee summer squash, carrots, onion, and garlic. Filll corn tortilla with beans (black or pinto) and cooked veggies. Top with cilantro and a dash of lime and/or hot sauce. It’s the day after harvest, I am a day late with the blog, sorry! 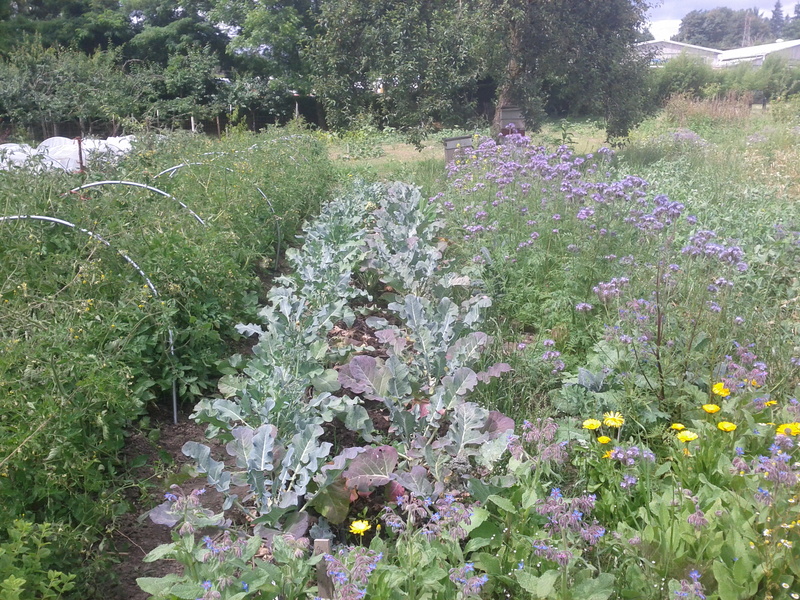 I hope the unknown veggies stared at you and let you know what to do with them::) We have been harvesting from the rows that are filling out the beds beautifully . 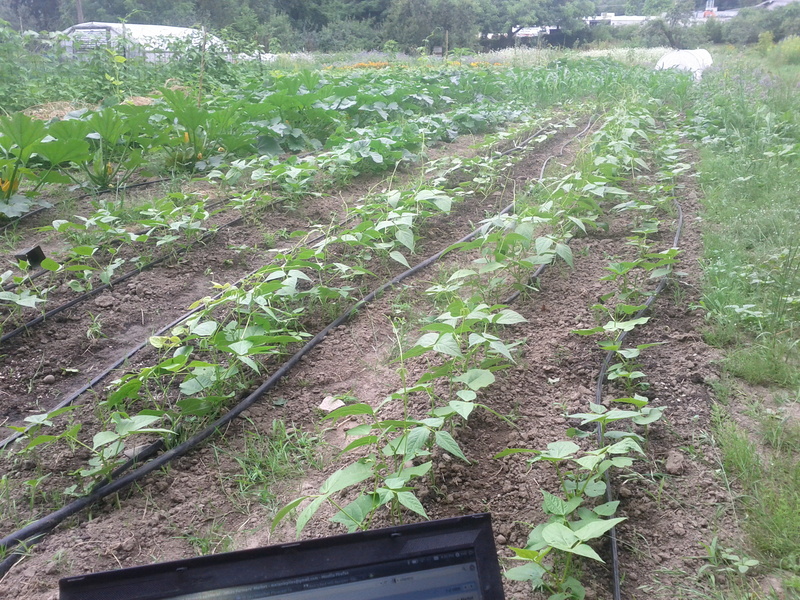 The heat brought incredibly fast growth and lots of irrigation. We’ve mostly been weeding and trellising. This last few weeks has been the only break in planting since March, and starting in a week it’ll be time to start some fall and winter crops like broccolli, cabbage, brussel sprouts, celeriac, fennel, chard and beets. 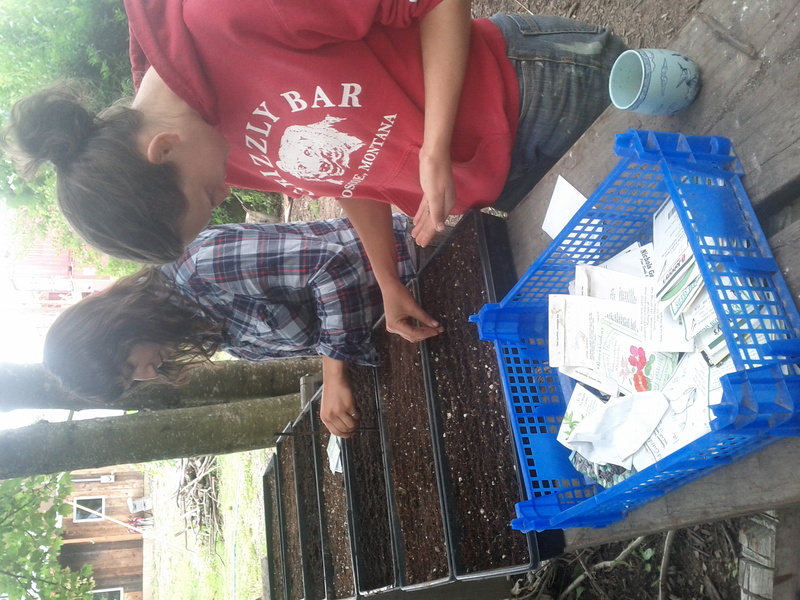 The trick at this time of year for newly planted seeds is to keep them wet, in contrast to early spring where the soil is often too wet to work in. It’s always changing out here and it’s fun to engage by paying close attention and noticing subleties. And then playing my part by taking action where it seems appropriate. I hope you are nourished by the veggiesss! 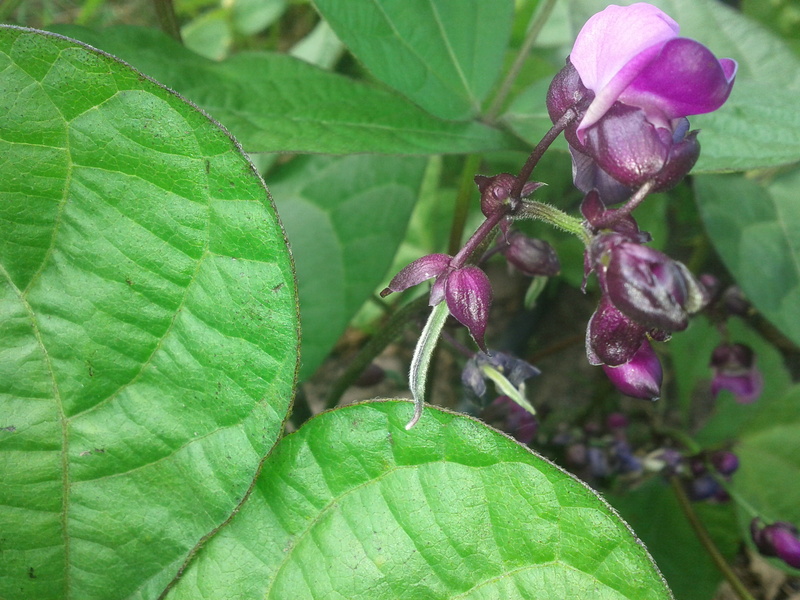 Snap or snow Peas – Still putting out tons of peas! Lettuce – This lettuce was planted on tops on the potato bed to maximize space use. Had to pull it as the potatoes are popping up. I’ve been adding nutritional yeast and berries to salad dressings. The yeast gives such great flavor and adds a nice texture too. Fennel – That’s it until the fall. Arugula Flowers – Flowers best preserved when stems are left in water like a bouquet. Add for beautiful and nutty sweet garnish. Cabbage or Broccolli – Mini red express cabbage variety and diplomat broccolli. 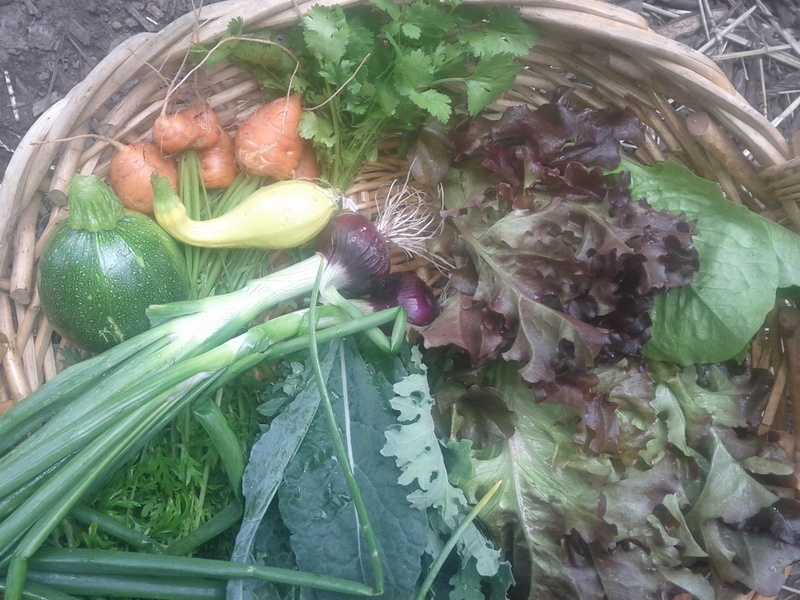 Only harvest of spring, but many more to come in fall. Green Garlic ­ It hasn’t been cured so it will just last a2-4 weeks. Green tops could be added to soup and then pulled out at end (hey’re tough). This is a delicious salad and includes beet, fennel, lettuce, topped with arugula flowers from the box this week. Maybe you still have thyme from last week:) The recipe has great pictures of ways to chop too. 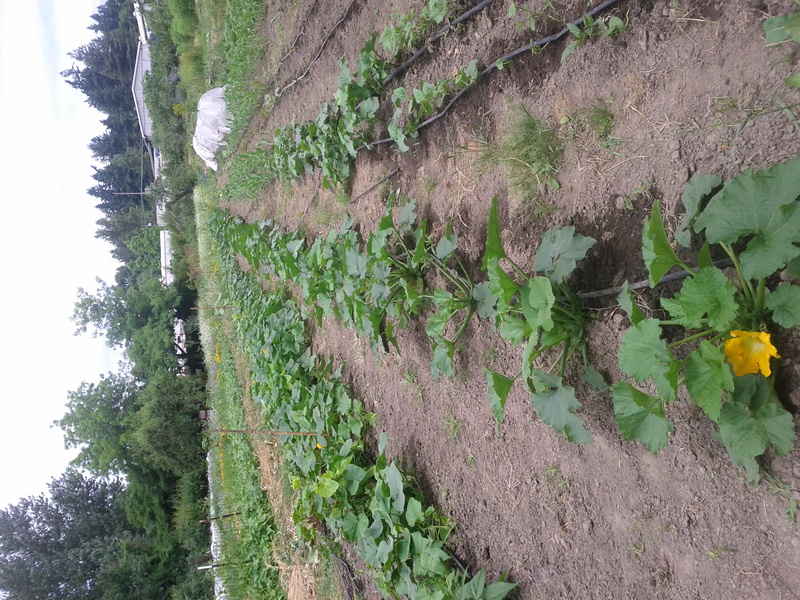 Summer and winter squash, cukes, and corn coming in strong! stirring to combine well. Add salt to taste, then chill, covered, at least 2 hours. In a kettle cover the beets with 2 inches cold water, bring to a boil, and simmer the beets, covered, for 20 to 35 minutes (depending on their size), or until they are tender. Drain the beets and under the cold running water slip off and discard their skins and stems. In a skillet bring to a boil the stout and the vinegar and whisk in 2 tablespoons of the butter. Stir in the beets, quartered, add the salt and pepper to taste, and keep the beets warm, covered. In a large skillet heat the remaining 2 tablespoons butter over moderately high heat until the foam subsides, in it sauté the reserved beet greens, stirring, for 5 minutes, or until they are tender, and stir in the salt and pepper to taste. Arrange the greens around the edge of a platter and mound the beets in the center.